As I survey the shelves and stacks of books towering next to my desk, some books call out to me and others remain silent, urging me to wait to pick them up another time, when we’re both ready. In this week’s column, I cover a few older titles that spoke to me. Though a few of these disappointed and could have been much better, some merit re-reading for their crystal-clear insights and dazzling writing. For many, the protest song reached its zenith in 1960s America when Bob Dylan, Buffalo Springfield, Country Joe and the Fish, Jimi Hendrix, and Joan Baez, among many others, wrote popular songs to protest American involvement in the Vietnam War, the mistreatment of various social and economic groups, and the lack of equality for African-Americans. In some cases – Dylan’s “Masters of War,” P.F. Sloan’s “Eve of Destruction,” Country Joe McDonald’s “I-Feel-Like-I’m-Fixin’-to-Die Rag” – the songs became anthems that defined a generation, confirming the idea that popular music could indeed bring a group together to promote a common cause for the common good. Lynskey’s study fails largely because he fails to offer a convincing definition of a protest song, to show why such songs’ importance to the times in which they are written and the reasons why they endure beyond those times, and to provide strong reasons that these 33 songs he gathers provide the best examples of protest songs. From the Brill Building to CBGB, from Washington Square Park to the Apollo Club, New York has been the birthplace and center of an astonishing variety of musical trends. 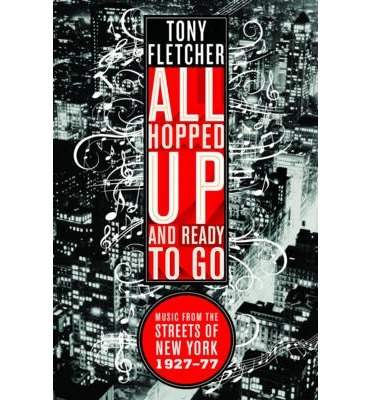 In his richly detailed study of 50 years of the city’s most important music history, All Hopped Up and Ready to Go: Music from the Streets of New York, 1927-77 (Norton), music journalist Tony Fletcher vividly recreates the birth and evolution of jazz, folk, pop, punk, and hip-hop as the strains of these musical styles emerged from the urban cacophony of New York. Drawing on interviews and archives of well-known stories, Fletcher nimbly explores the ways that various musical styles benefit from, and grow out of, their contact with their surrounding cultures. For example, the music scene of the Lower East Side was a direct product of the area’s thriving movements in poetry, filmmaking, avant-garde music, and experimental theater. Fletcher chronicles the beginnings of the folk movement in the singalongs in Washington Square Park to the opening of the Folklore Center on MacDougal Street in 1957, where musicians held hootenannies and established several folk clubs, such as the Bitter End, where Dave Van Ronk and others gathered a following. Fletcher observes the folk scene on the wane, as John Sebastian leaves Jim Kweskin’s Jug Band and teams with Canadian Zal Yanovsky, formerly of the Mugwumps (which became the Mamas and the Papas), to form the rock band, the Lovin’ Spoonful, and provides one of the best brief histories of CBGB, perhaps the most important music club in New York’s music history. For all his insight, Fletcher perplexingly and incorrectly refers to Byrds’ founder Roger McGuinn as “Jim McGuinn” throughout the book, and he glaringly omits one of New York City’s most important singer-songwriters, P.F. Sloan, whose group, the Fantastic Baggys, was the only surf rock group to hail from the City. Otherwise, Fletcher’s terrific music history captures the teeming life of New York’s thriving music scene. In his rollicking collection of mostly previously published essays, Heroes and Villains: Essays on Music, Movies, Comics, and Culture (Da Capo), David Hadju (The Ten-Cent Plague; Positively 4th Street) – who surely deserves the title of king of contemporary pop culture criticism – combines the cutting candor of Lester Bangs, the perverse bravado of Robert Warshow, and the measured and judicious cultural learning of Lionel Trilling as he takes aim at subjects ranging from jazz, rock, and country music, to cartoon characters like Elmer Fudd, to broader cultural topics such as blogging, MySpace, and remixing. Like any collection of essays, Hadju’s is a bit uneven, but his immense reading, research, and experience of pop culture shines through in his delightful writing. Hadju affectionately writes about the old Warner Bros. cartoons, recalling the respite from the tumult of the ’60s that the cartoons brought him before dinner every night. He loves Elmer Fudd, the strange, lonely animated human among the cast of Bugs Bunny, Daffy Duck, and others, because Elmer is an oversized newborn. His head a fruit bowl of round shapes: honeydew cheeks, plum nose, cantaloupe eyes on a blue-ribbon Crenshaw head. Hadju uses the release of Joni Mitchell’s then-most-recent album, Shine, as an entrée into a moving retrospective of her music and a bit of mourning about her absence on the music scene for several years. He laments the lack of lyrics on this album, though he points out that the music is nonetheless as gorgeous as some of the best of her earlier work. Using the chorus of Mitchell’s most famous song, “Big Yellow Taxi,” he observes that Shine is a kind of revelation, of the saddest kind, and it proves that you don’t know what you’ve got ’til it’s gone. As he superbly compares the music of Lucinda Williams, Taylor Swift, and Beyoncé, Hadju captures Williams perfectly as a woman rare among pop stars for her unfeathered intelligence, untheatrical carnality, and uncompromising humanity. Hadju’s opening essay on jazz great Billy Eckstine is, alone, worth the price of the book, for its poignant portrait of a brilliant musician whose star might have risen even higher if he’d been born in a different era. Hadju’s essays never fail to amuse, please, and provoke. From the rollicking debut of “Fingertips – Part 2” to the funk piano and synthesizers of “Superstition,” Stevie Wonder’s brilliant music has managed to capture the hearts of his listeners while at the same time probing the limits of musical styles and moving soul and rhythm and blues to new musical levels. Born in poverty in Saginaw, Michigan, Wonder lost his sight soon after he was born. His blindness heightened his sense of hearing, and he soon began to master the toy musical instruments that his absentee father would bring him. Very soon, Wonder graduated from toys to the real things – his barber gave him a Hohner chromatic harmonica. His church choir director, as well as his neighbor, allowed him to play for hours on their pianos, and the local Lions Club gave a drum set to Stevie after hearing him play it. Soon Wonder was the hit of Motown, and his career took off like a comet, only to burn out and lose some of its fiery glow in the 1980s and ’90s. 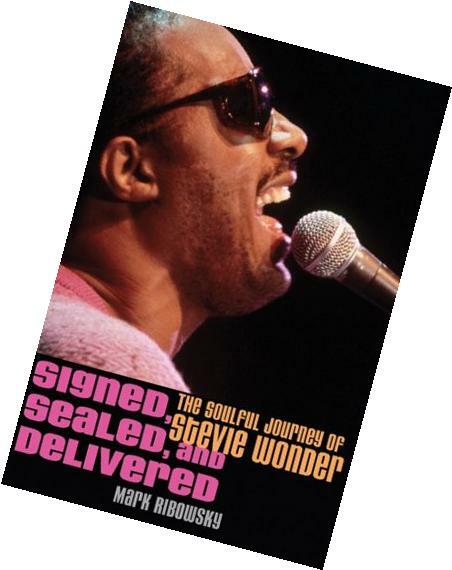 In Signed, Sealed, and Delivered: The Soulful Journey of Stevie Wonder (Wiley), music journalist Ribowsky (The Supremes; He’s a Rebel) traces the rapid ascent of Wonder’s musical career as well as the tumultuous ups and downs of his personal life in this workmanlike and pedantic book. Ribowksy’s exploration of Wonder’s music is first-rate, but the lack of any interviews with Wonder himself and the tendency to overlook any of his faults turns this into one fan’s hagiography rather than a valuable biography of Wonder. For over half a century, Nat Hentoff, the Duke Ellington of jazz writing, has deftly chronicled the lives of jazz musicians, the rise of jazz music in America, and the intimate relationship between jazz and civil rights, weaving intricate rhythmic prose around themes of loss, triumph, and musical virtuosity in much the same fashion as his jazz heroes weave their riffs around various musical themes. In At the Jazz Band Ball: Sixty Years on the Jazz Scene (University of California), a collection of 64 interviews, essays, and recollections (many of them previously published), Hentoff ranges widely over numerous topics from the meaning of jazz and the elements of a perfect jazz club to profiles of Duke Ellington, Artie Shaw, Oscar Peterson, and Anita O’Day. Hentoff vividly recalls hearing Shaw’s “Nightmare” while walking past a record store in Boston when he was 11 years old, and being touched as viscerally by Shaw’s haunting music as by the passionate and mesmerizing singing of his synagogue’s cantor during the high holy days. In a paean to Louis Armstrong and the trumpeter’s recognition of the healing power of music, Hentoff discusses the development of the Louis Armstrong Center for Music and Medicine at New York’s Beth Israel hospital, which focuses on medical treatment for patients with asthma and chronic pulmonary disease. Because he realizes the power of jazz to educate young people about civil rights as well as music, Wynton Marsalis becomes, in Hentoff’s eyes, the Leonard Bernstein of today. Although the collection is repetitious and uneven in quality (as such collections often are), Hentoff’s essays often generate thoughtful insights into this uniquely American musical form. In Listen to This (Farrar, Straus and Giroux), the brilliant follow-up to his award-winning The Rest is Music, New Yorker music critic Alex Ross rambles over a wide musical landscape, from classical to hip-hop, to folk and rock, singing loudly that music is not a self-sufficient sphere but a way of knowing the world. Even though all but one of these 19 essays have appeared previously in the New Yorker, they all have been substantially revised and offer astonishing new insights into subjects as diverse as classical music in China, opera as popular art, the crisis in music education, and the ways that technology changes music. We also get Ross’s portraits of Mozart, Marian Anderson, Björk, Kiki and Herb, and Sonic Youth, among others, as he probes the ways that the powerful personalities of composers and musicians stamp an inherently abstract medium so that certain notes, songs, or choruses become instantly recognizable as the work of a certain artist. In 1998, for example, Ross followed Bob Dylan on a 10-day tour of mostly smaller venues such as state fairs and minor league baseball stadiums, interviewing fans and critics along the way in an effort to understand Dylan’s enigma. He discovered that Dylan’s music remains so timeless because Dylan himself withdraws his personality from the scene and lets the music rise, making old songs new every time he plays them. Ross’s virtuoso performance in the one original essay in the collection, “Chacona, Lamento, Walking Blues,” isolates three different bass lines as they wind through music history from the sixteenth-century chacona – a dance that promised the upending of the social order – through the laments of Bach, opera, and finally the blues. Who else but Ross could so nimbly, and in such dazzling fashion, find the common ground on which 16th century Spanish musicians, Bach, players from Ellington’s 1940 band, and Led Zeppelin’s bassist John Paul Jones can stand, at least momentarily? Ross’s astonishing performance merits a standing ovation.